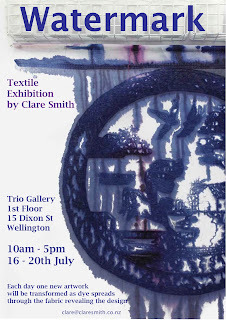 Textiles on the Edge... (of the Planet): My Exhibition is up! 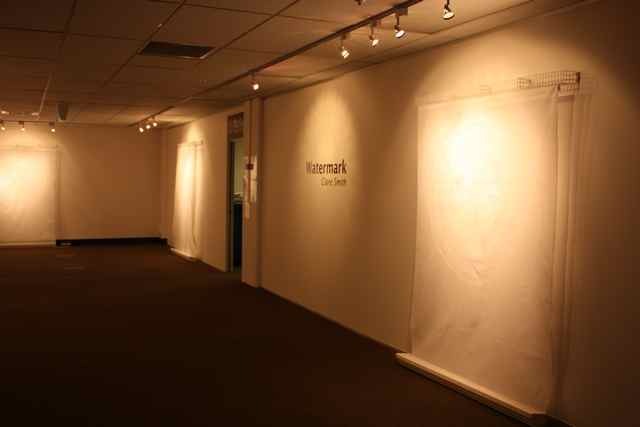 Today we hung the exhibition. A big thank-you to my brother and my son who hung all the racks, drilled all the holes and patiently moved all the lights around for hours. Here is a sneak preview - the wallhangings are all white at the moment, the images hardly show until you get quite close. As they are white on white against a white wall they are also hard to photograph. At 10am on Monday when the dye starts to spread down through the fabric, they will be much easier to see. I can't wait to see what happens. I will post pictures each night to show what has happened that day and if I work out how to use my new video camera I will post video too. Here is how it looks at the moment along one wall. Here is the poster, please come up and say hi. This is a link to Google maps for 15 Dixon St. The gallery is on the 1st floor of Whitireia City Campus (Creative Writing). This looks enticing. I am looking forward to hearing how you created the images!